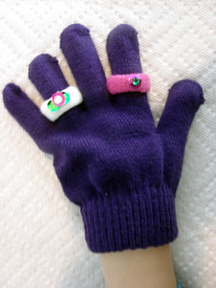 Begin by finding some mismatched magic stretch gloves (or buy them for $1.00 per two pack.) Cut the fingers of one of the gloves. Then cut the tips off of each finger so you have about a 1 inch tube. Stretch the tube, and eventually the edges will curl in on themselves. Then flip the tube inside out for a ring. For this activity mix equal parts glue and shaving cream in a pie tin. 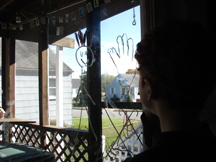 Allow your child to paint with the mixture on to construction paper. The shaving cream glue mixture will dry to a 3D masterpiece. OR – get out those old snow boots and let your child stamp puffy paint shoe prints on their paper. For a fun, sensory, and totally mess free activity spray an entire bottle of shaving cream on your kitchen table. The stuff from the dollar store works great! 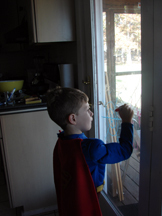 Let your child use the table as a canvass where they can draw in to the shaving cream. Throw in a bunch of googley eyes or jingle bells and they can form snow men from the shaving cream. The shaving cream will disappear right into their clothes as it dries, and is a piece of cake to wipe off of your tables. My camp counselors introduced me to the beauty of shaving cream as a means to clean off tables after a messy craft activity. Of course, just like frosty will melt as it gets hotter, your children’s shaving cream creations will also disappear. You all know how much I like it open -ended, but sometimes a craft comes along that just steals your heart. I found this in Family Fun magazine, of course! ponderosa pinecones. You can find htis this tiem of year very cheap, with the added bonus of cinnamon scent at your nearest craft store. I think the picture pretty much explains it all. 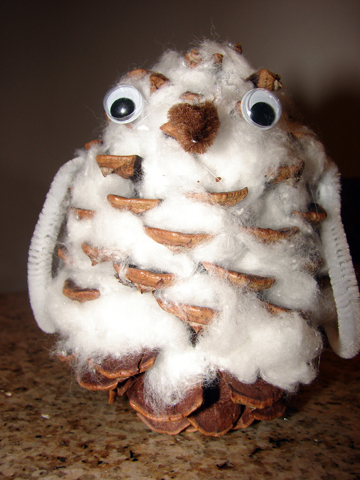 For the fluffiest result, stuff the cotton pieces into each of the crevices on the pine cone. Don’t forget to subscribe for updates every time I post. The subscribe button is on your right. Seriously, by today’s standards I do not think I buy my kids too many toys. 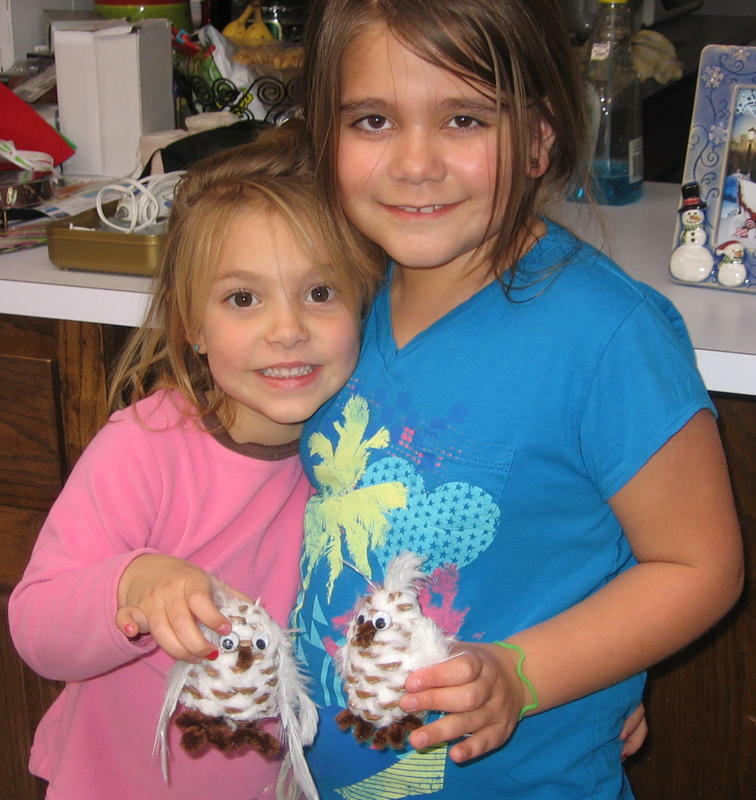 However, between happy meals and birthdays and grandparents….the kids seem to accumulate a lot of toys. Every year at this time when I KNOW, more toys will be coming in to the house, I always have my children pick out toys they no longer play with, but are still in good condition. In the past I have given them a box to fill, which they HAVE to fill. We then donate the toys. This year is the first year my kids every complained about it. Now, I have been weeding out all year, so it is possible that they were really attached to their toys, but I do not think so. 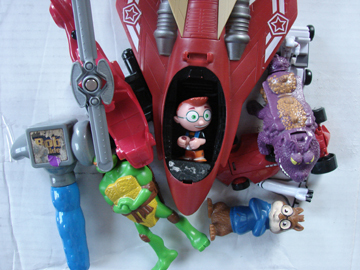 So, I filled a box with toys I thought they no longer played with. They were then allowed to go back through the box and pick out five toys each to save. After the toys were sorted out the kids made I-Spy arrangements on a whiteboard with the toys we were donating. We took pictures of each arrangement (see above photo.) To get a copy of all of the photos, send me an e-mail. By the end the day the kids were excited to be giving away thier toys. If you know someone who needs to get rid of some toys, SHARE this post. Hello – this is going to be short, but I hope helpful post. Press yor fingers into the bottom of each muffin section to round out the bottom. 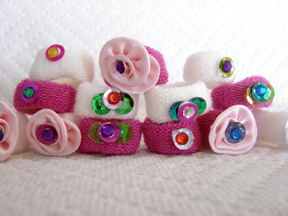 The rounded bottom will make it easier for your little one to hold onto the crayon cookie. Fill each muffin tin with crayon pieces. Make sure to group warm colors together and cool colors together. Too much mixing of crayons will give you brown. In your mind you will be makign a rainbow crayon, but what will come out will be more like a mud pie. Place tin in the oven (put an oven liner underneath for wax spills.) Cook until the crayons are mostly melted. Cool off in the cold outdoors – the colder your tin gets, the easier the crayons will pop out of the tin. You can also put the tin in the freezer. A small collection of these with some construction paper also makes a nice gift. 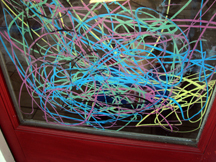 This piece is titled “Train Tracks.” As my little guy created this with window crayons and A LOT of energy and movement, I couldn’t help but think of Jackson Pollock. I wonder if J.P. came up with sounds effects while he worked as well. By the way, the crayons really do come off with just water. Another nod to Family Fun Magazine which had these cuties in a recent issue. On the surface these look like a simple craft, which they are. 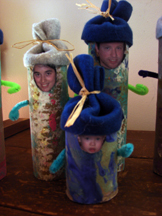 However, you can tweak a craft activity to make it have more choice, and a little more open ended. To begin, I put out 8 small plates of paint, all different colors. I only put about 1 tsp of paint on each plate. Then I put small sponges with varying textures on each plate. Finally I sat my four year old at the table with 20 toilet paper tubes and told him to have at it. He worked on his tubes for about 45 minutes…..I only intervened to add more paint to the plates as needed. He stoppd only when he ran out of tubes, I know he could have done hundreds, he was enjoying the activity so much. If you like this activity share it with a few friends. 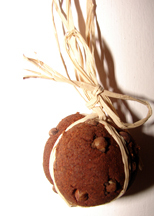 My kids and I did not make the Pomander pictured here, but it was what I had intended. I thought the skin of a navel orange would be soft enough for the fingers of my 4 and 7 year old ot oush whole cloves into. I tried with my 4 year old, no luck. “Oh well,” I thought, “maybe this project will be for my 7 year old.” Fail #2. Then I had a brainstorm…..the Applesauce Cinnamon dough I had made a few days earlier…would be the perfect consistency to make small pomanders. Both of my kids were able to make small balls out of 1 – 2 tbsp of the dough. Then I gave them each cloves to push in to their dough balls. I then gently rolled each one ot make sure the cloves were fully in. They dried on a drying rack in 2 days. I am just providing a link for this one. How To Make Seed Paper You Can Plant. I have made paper with children from three years of age all the way through eight graders. It is something everyone loves. It’s messy, creates something usuable from unwanted paper, and this version can be planted in the spring to grow flowers. I have seen and read many articles about making paper over the years, I chose this one for one simple reason, it doesn’t suggest you use or make a frame for shaping the pulp. Of course, you can use a frame, but this article gently explains that it really isn’t necessary. Unless you are trying to create perfect writing paper (I assume you are not since you are look at this blog for things to do with your young children,) then you do not need a frame. The article comes from a blog titled “Urban Debris,” which has lots of awesome ideas. Once your homemade paper is dry, have your child color on it with water color paints. Homemade paper makes an incredible canvass for water color. Then attach each piece to an index card and give as a gift. What Is Open-Ended Art Anyway?